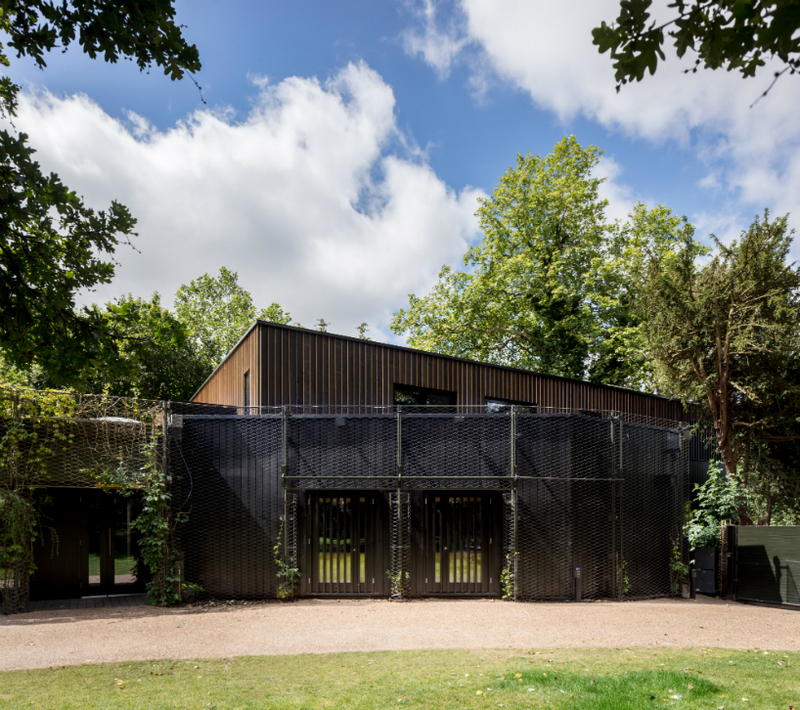 london-based practice reed watts architects has completed a new building housing new rehearsal studios and catering kitchen for the regent’s park open-air theater in westminster, central london. 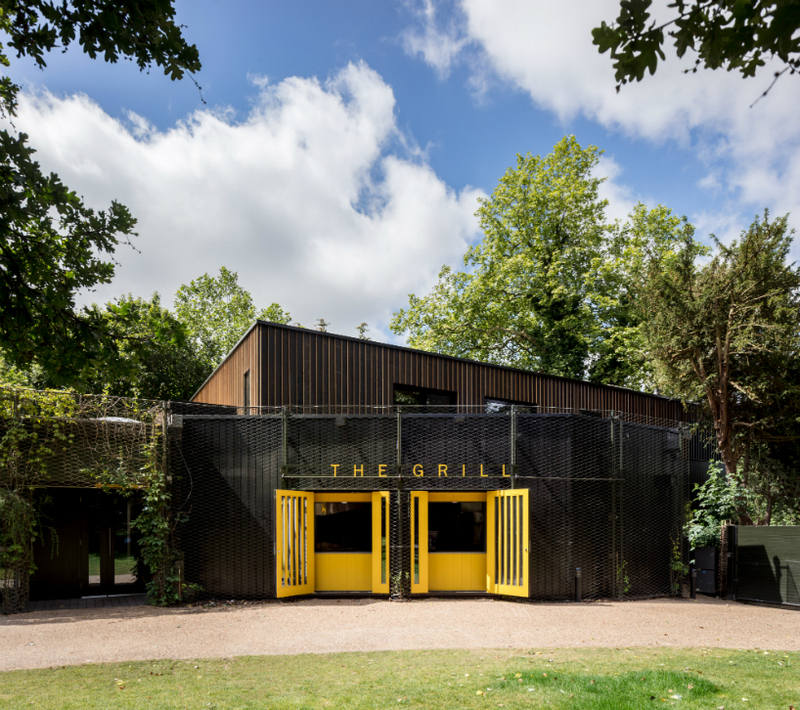 the 480 sqm project was built in just seven months amongst the protected royal parks trees and brings together the theater’s operations onto one site for the first time in its 86-year history. 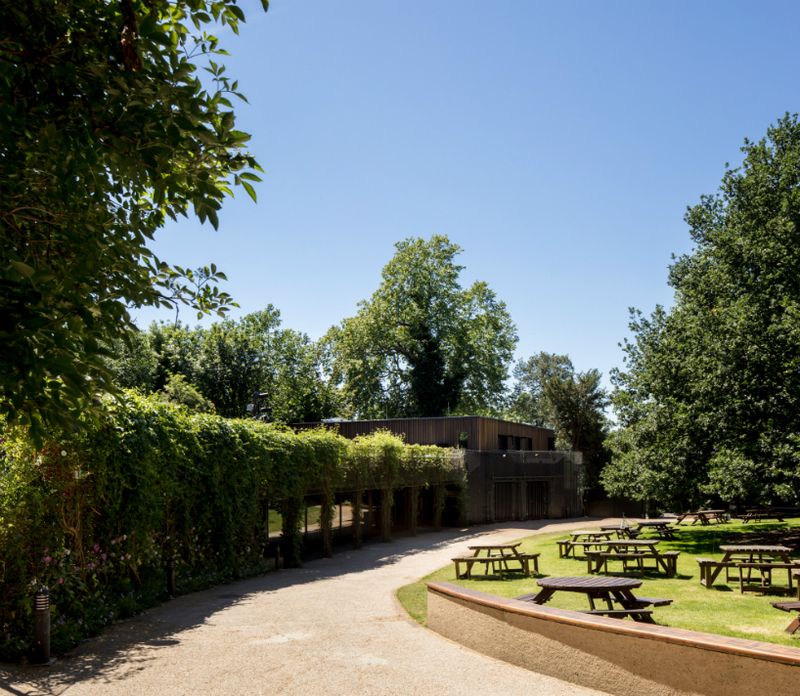 regent’s park open-air theater is a uniquely located cultural institution that hosts audiences of over 1,200 people each night during the summer. reed watts’ designs respond to the woodland setting with subtle contextual architecture that works with and celebrates its surroundings. the structure is constructed from a prefabricated, cross-laminated timber (CLT) panel system — it required small foundations to be erected quickly, thus reducing the impact on neighboring tree roots. 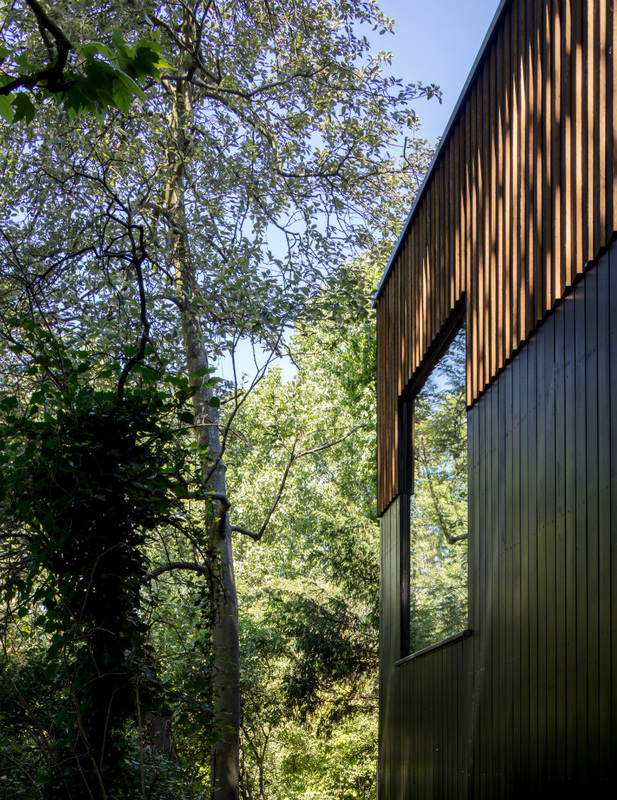 externally, the building is clad in a band of darkly stained larch at the base, with a crown of textured cladding at higher levels. 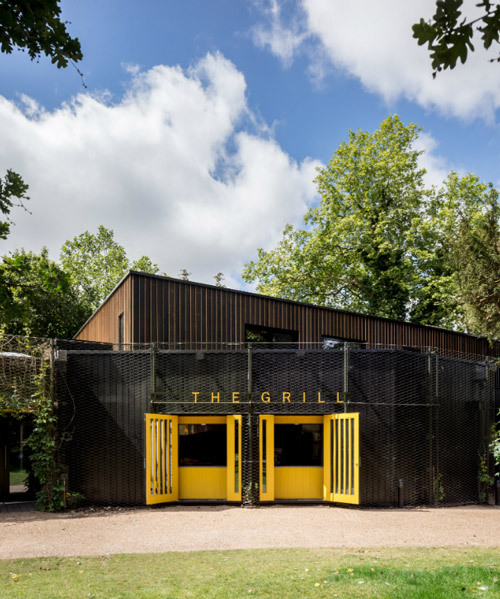 the cladding has been designed so that it presents a black restrained façade to public sides with a richer golden texture visible from the theater. 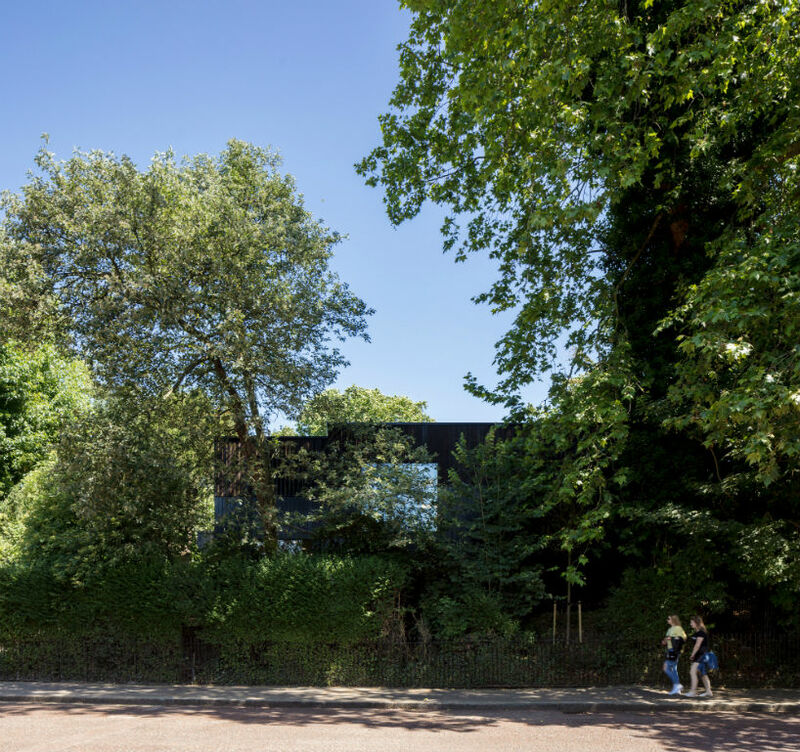 located in the far corner of the site, the new structure is surrounded by mature trees, so the approach is recessive and thoughtful design, which reads as a natural extension to the existing theater buildings along the boundary edge. 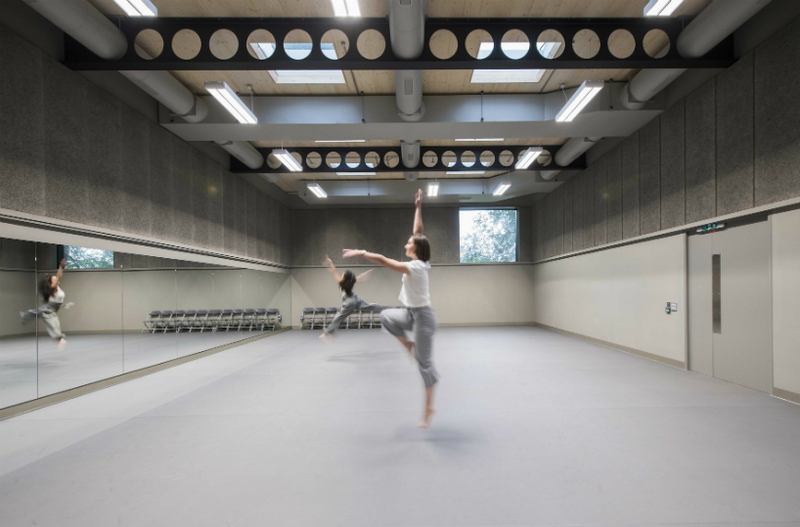 at the first level, the new space is split into two with a new catering wing providing food for audience and staff which is wrapped around the double-height studio. 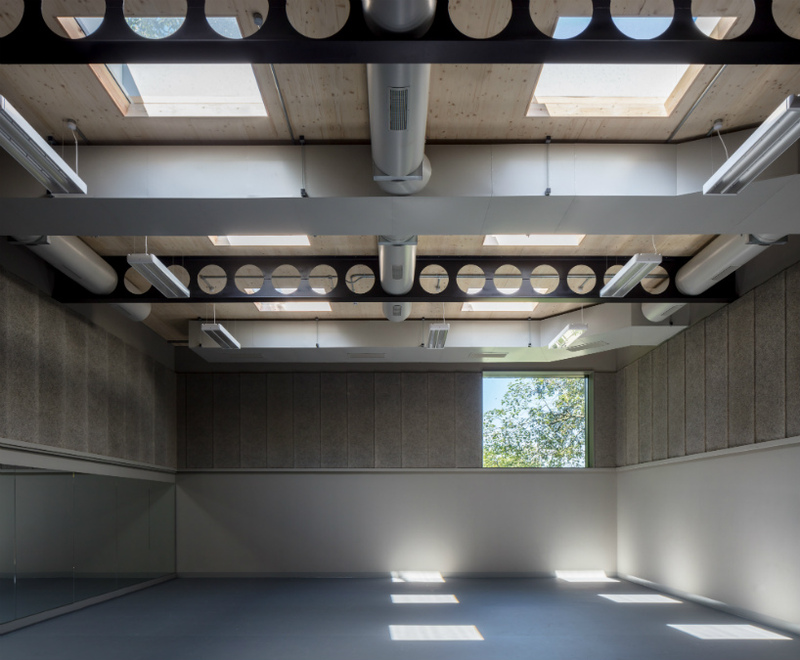 the floor above provides further rehearsal spaces and a green room. 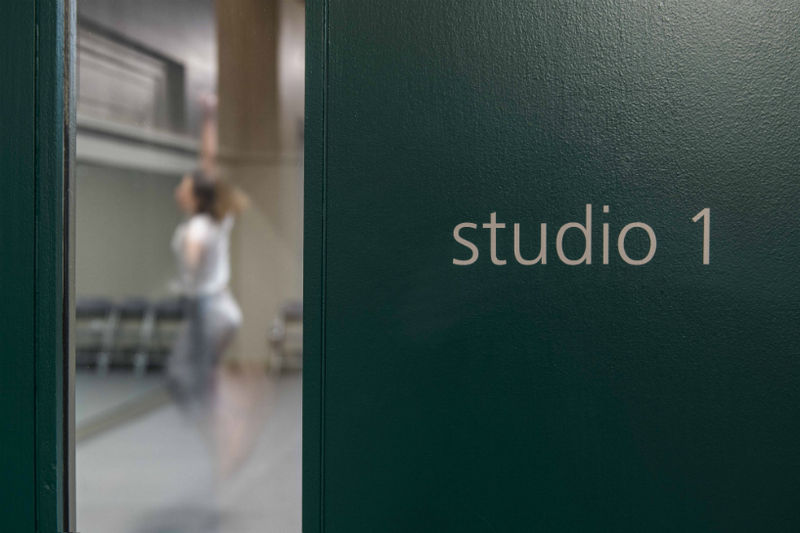 the new studio is an innovative and adaptable rehearsal space that suits the needs of the theater’s productions including dancers, actors, and acrobats who had previously relied on off-site facilities. 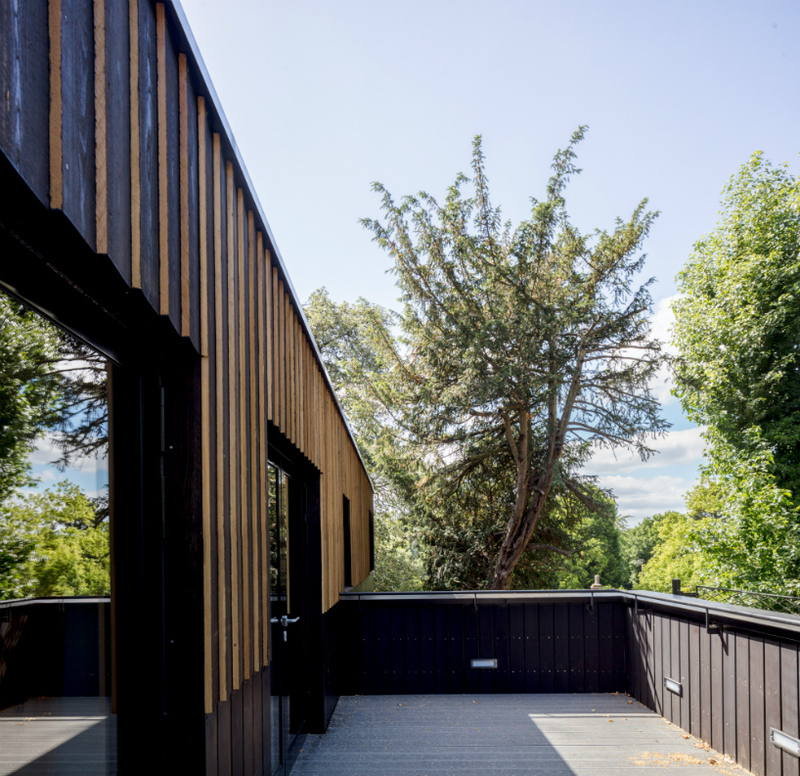 the open 14.3 m x 10 m studio includes 4.1 meters-high ceilings and a full height mirror and curtain, natural light and a glimpse of the adjacent trees is provided through roof lights and a large framed window, all which can be blacked out by integrated blinds. 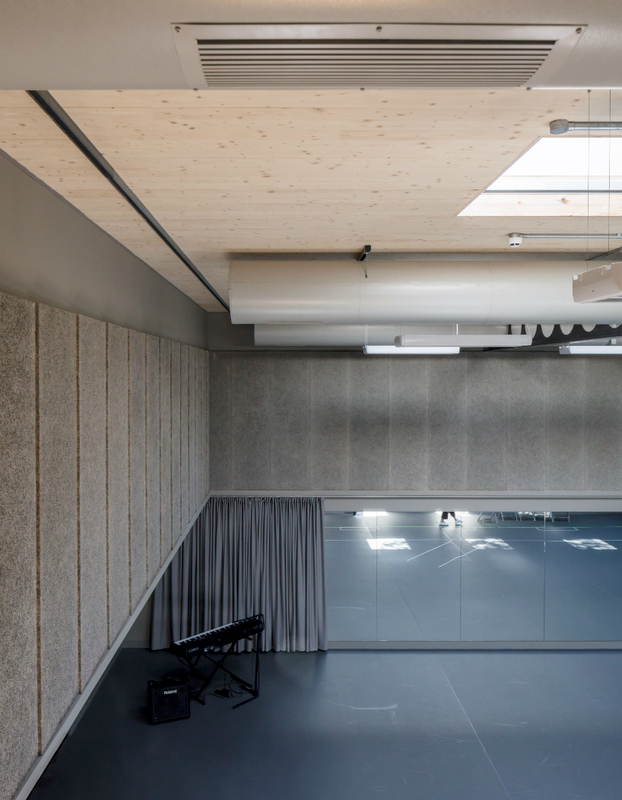 the studio also includes sprung floor which has a harlequin vinyl finish with underfloor heating. the space is mechanically ventilated and cooled from ductwork at the high level. the new kitchen facilities double the catering space, which allows the theater to improve and broaden its food offer. the kitchen provides stations for 5 chefs and includes a servery which colorfully opens out pre-show onto the picnic lawn. 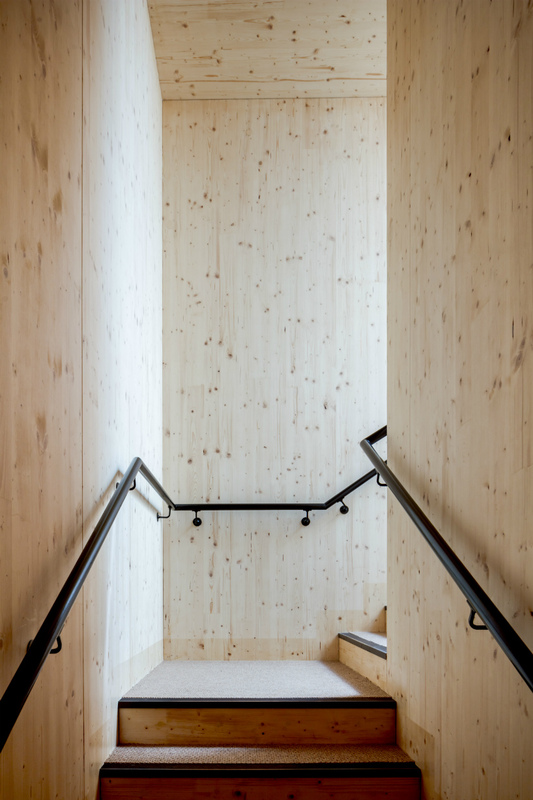 in a further reference back to the woodland setting, the CLT frame is exposed in circulation spaces including the stair which leads to rehearsal spaces and green room on the first floor.